I love a rose print. Add a matching hat and I'm over the moon! 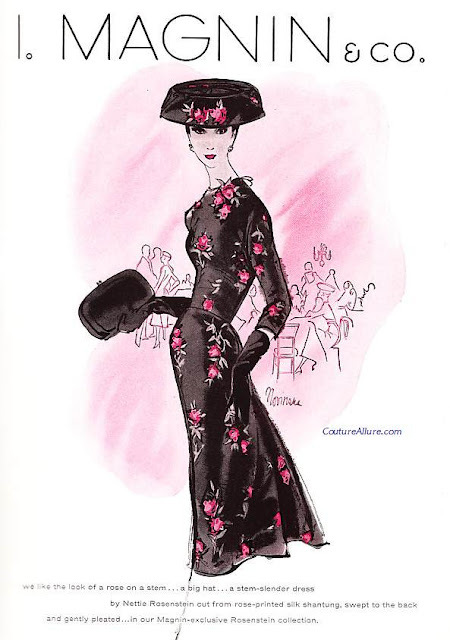 I. Magnin featured this dress by Nettie Rosenstein in a full page ad from 1956. "we like the look of a rose on a stem...a big hat...a stem-slender dress by Nettie Rosenstein cut from rose-printed silk shantung, swept to the back and gently pleated...in our Magnin-exclusive Rosenstein collection." Perfection, pure and simple. If anyone can tell me what the illustrator's signature says, I would really appreciate it. I. Magin ad for Harper's Bazaar, March 1956.